Savills is an international real estate adviser. We are based all across the world in all major cities. We are the third largest property advisory company in the world and the largest in the UK by turnover, and we employ around 35,000 people across the world – 3,500 in the UK alone, across all property sectors including consultancy, agency and property management. All three main departments in the Nottingham office require a degree – that’s a key thing for us, surveying needs graduates with a related degree. However we are an entrepreneurial business and also believe in success via industry merit. We began working with Nottingham Trent University (NTU) primarily due to location. 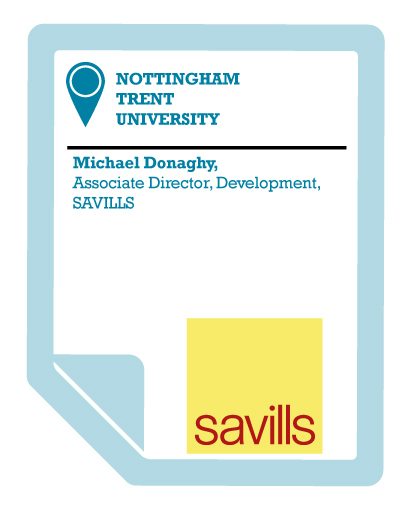 We have a particularly strong relationship with Nottingham Trent University due to their Employability Co-ordinator who actually used to work at Savills. He knows the industry and what we are looking for. He’s also very business savvy. NTU runs a real estate course which is recognised as being innovative and attracting good students. The students we have had on work experience from NTU have been of a very good standard. The experience helps us to get to know the personality and abilities of individuals and direct them to apply for our graduate scheme, it nurtures the business. The most gratifying thing about working with universities is when you’ve had somebody on work experience (we take about 3-6 a year for a week or two) and seeing them get through to the graduate recruitment interview stage. That’s happened twice in the last two years – a 100% record for NTU in the last two years. We look for graduates because they come with a good understanding of the industry, they’ve studied all the core subjects and often they’ve had a one-year work experience placement. Generally students on work experience come with a positive attitude. If they’re putting themselves forward for work experience it shows awareness of the industry and a drive to succeed. Students now seem to spend all their summers doing work experience, not just tacked on to the end of their degree but more proactive throughout their degree. This is especially the case at Nottingham Trent University. Their CVs show graduates have considerable work experience – many weeks and months of it. Graduates can take the business in slightly different directions. New ideas, drive and energy can be more abundant in graduates than people later on in their career. We believe in bringing young talent in, taking them through and getting the best out of them and them getting the best out of the company.